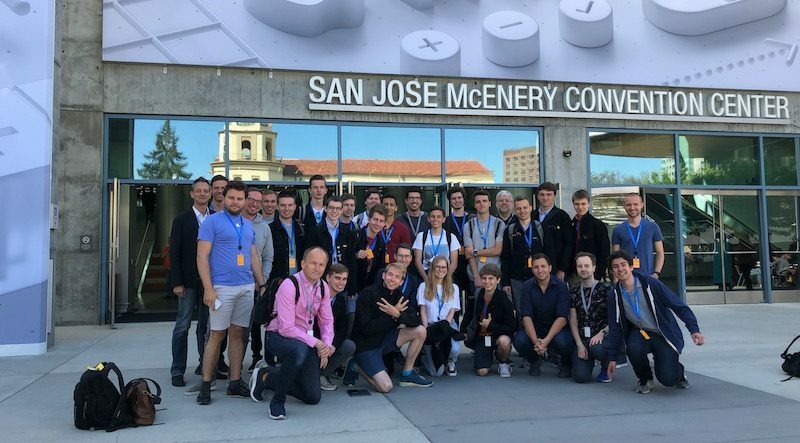 Last week, Apple hosted its annual Worldwide Developers Conference in San Jose, where over 5,000 developers descended upon the McEnery Convention Center for five days of coding labs and sessions, one-on-one consultations with Apple engineers, get-togethers, and even some early morning exercise. Among those developers were some 350 scholarship winners, who each received a complimentary WWDC ticket, lodging for the week, and a one-year membership in the Apple Developer Program. Each year, students aged 13 or older at accredited schools and STEM organizations can apply to become a WWDC scholar. This year, Apple tasked applicants with creating a short interactive scene in a Swift playground, and winners were selected based on the technical skills shown, creativity, and accompanying written responses. An example of a winning submission from Giovanni Filaferro, a four-time WWDC scholarship winner from Italy. This year’s scholars come from all corners of the world, including Australia, Bulgaria, China, Germany, Greece, India, Italy, Malaysia, Poland, Spain, Sweden, Brazil, Canada, and dozens of others. 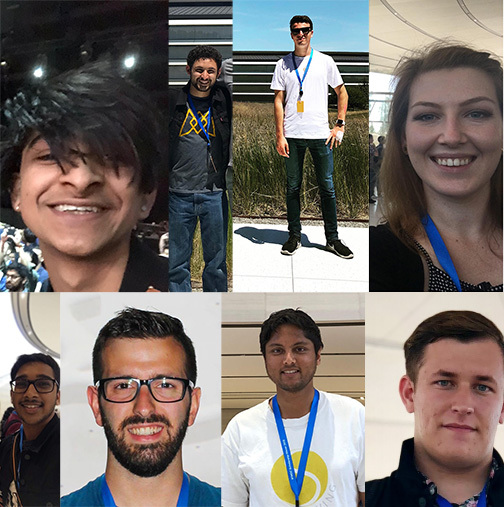 Many of the 2018 winners are listed on the WWDCScholars website, run by two-time WWDC scholar Sam Eckert. Apple was kind enough to provide me with a media pass to attend WWDC this year, and during my week in San Jose, I crossed paths with a few of these scholars. After learning about how much fun they were having, I was inspired to connect with more scholars to have them share their day-to-day experiences. Many of the photos in this article were provided to me by Axel Boberg, a talented photographer and WWDC 2018 scholarship winner from Sweden. Check out Axel’s personal website for galleries of other beautiful photos. 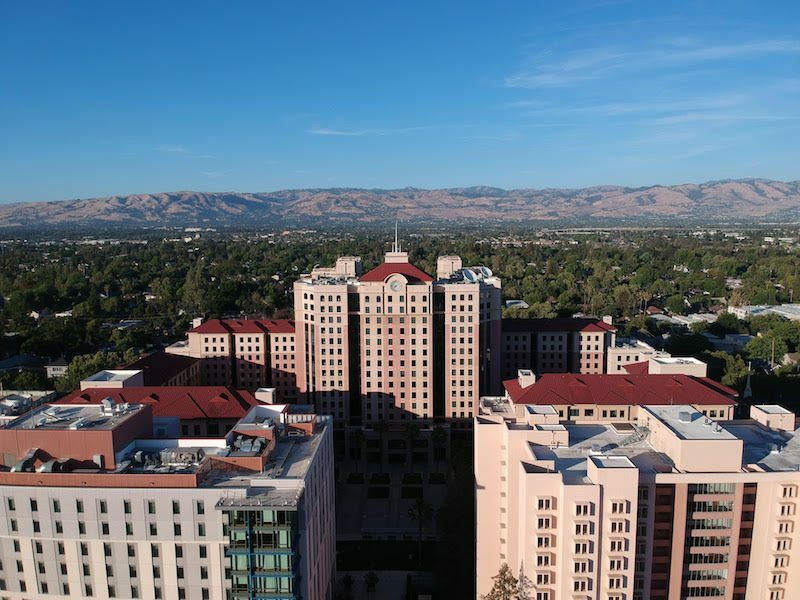 Lodging was provided to all scholarship recipients between Saturday, June 2 and Saturday, June 9 at San Jose State University dorms, located approximately a half mile east of the McEnery Convention Center. 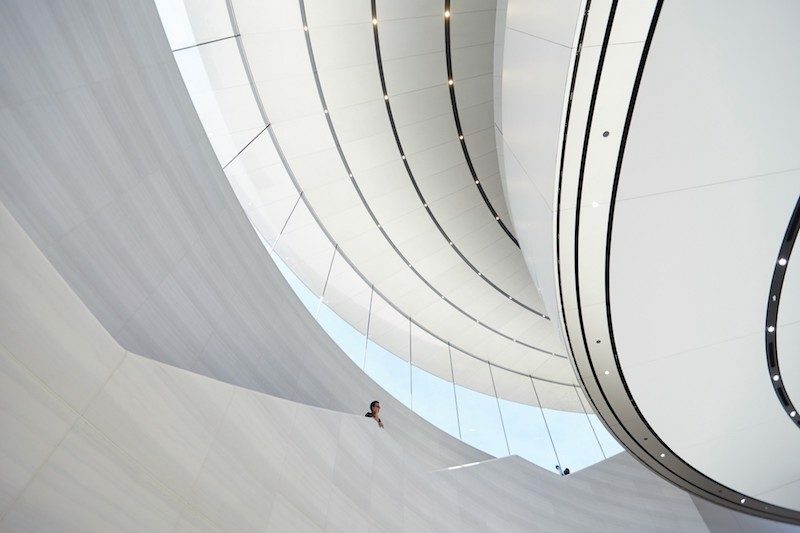 Upon arriving, many developers used what little free time they had to travel around the San Jose area, with some making the obligatory visit to the Apple Park Visitor Center in nearby Cupertino. There, a terrace on the roof provides a unique view of Apple Park’s main circular building and its surrounding landscape. Unbeknownst to them, the scholars would have a much closer view of Apple’s new headquarters the very next day. The scholars headed to McEnery on Sunday morning to receive their WWDC 2018 badges, jackets, and a collection of Apple-themed pins, with their own line separate from other developers to expedite the process. After a quick breakfast, they were instructed to board a shuttle bus to a “secret location,” which turned out to be Apple Park. The group was unable to tour the main building, but they did have lunch at a Caffè Macs employee cafeteria in one of Apple’s ancillary office buildings on nearby Tantau Avenue. Next, they walked to Steve Jobs Theater, a gorgeous glass structure with a nice view of Apple Park in the distance. After a short time for photo opportunities, the group headed down the stairs to the actual theater on the lower level for orientation. There, they were welcomed on stage by Esther Hare, Senior Director of Worldwide Developer Marketing at Apple, who was the lead chaperone for this year’s group of scholars. During the orientation, they were given advice on how to make the most of their opportunities at WWDC. Apple also stressed the importance of areas like accessibility, inclusion, diversity, the environment, security, and privacy. After listening to Apple’s environmental chief Lisa Jackson, and software engineering manager Tim Isted, the scholars were ecstatic to be greeted by Apple CEO Tim Cook, who congratulated all of the winners for their accomplishments. 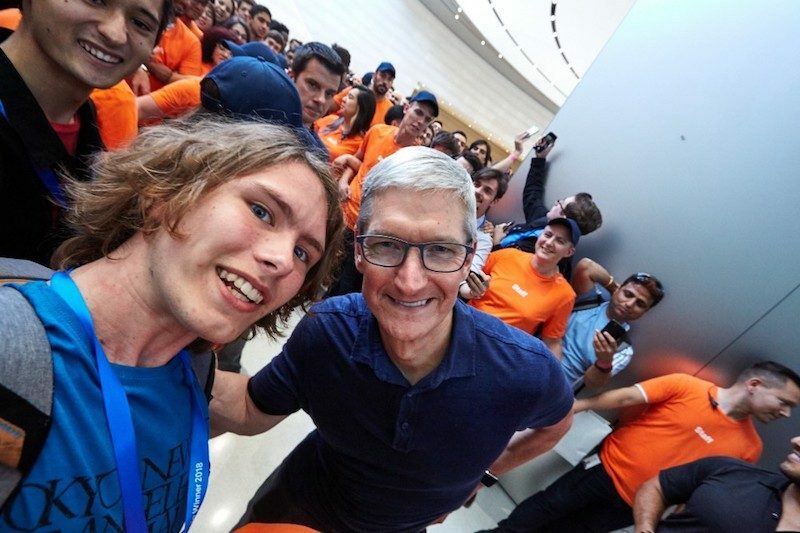 Later on, Cook, who had told them all he had to leave to prepare for the WWDC keynote, surprised them by appearing for photo opportunities. After that, dozens of Apple engineers were on hand to answer any questions about software development, which many of the scholars found to be very helpful. On the way down the hill after leaving Steve Jobs Theater, each scholar was provided with a free pair of AirPods. The group then boarded shuttle buses back to their lodging, where many developers relaxed ahead of an eventful Monday. 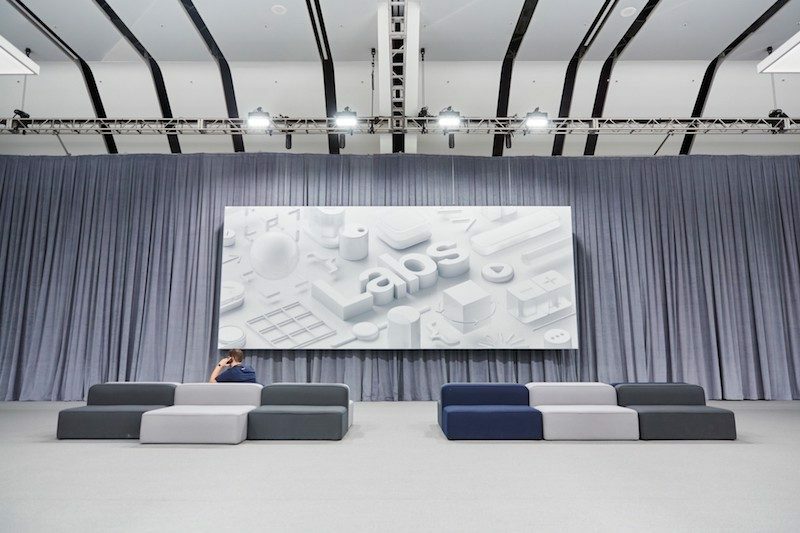 In the morning, the scholars returned to McEnery to attend the WWDC keynote, where they had a reserved seating area. Like the media, they had a dedicated line to get inside, unlike the rest of the developers. More succinctly, the keynote was “lit,” in the words of 18-year-old scholarship winner Amit Kalra. That’s slang for fun, or exciting, or awesome, among other things, for those reading this and feeling a bit old. After the keynote, some of the developers went to the Scholarship Lounge that Apple set up at McEnery. 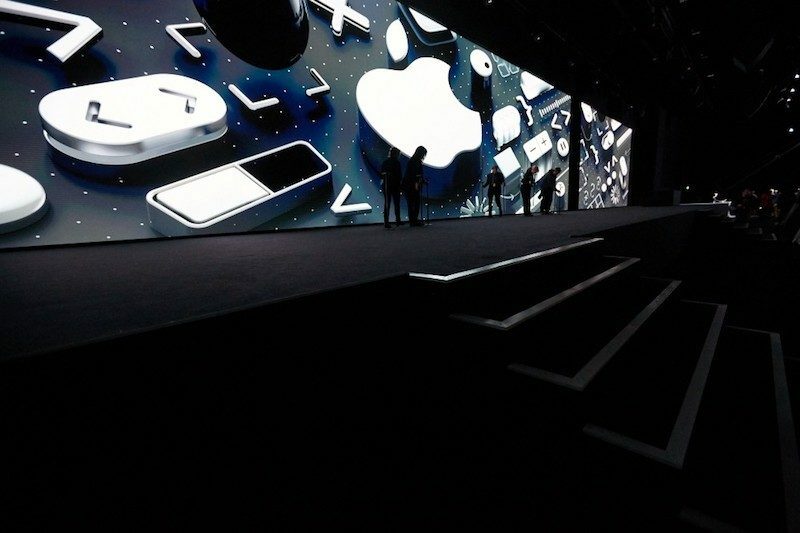 There, they had complimentary lunch and downloaded the beta software that had just been previewed at the keynote. Multiple scholars told me the lounge had extremely fast internet via Ethernet. Next up was the annual State of the Union, a few hours after the keynote. 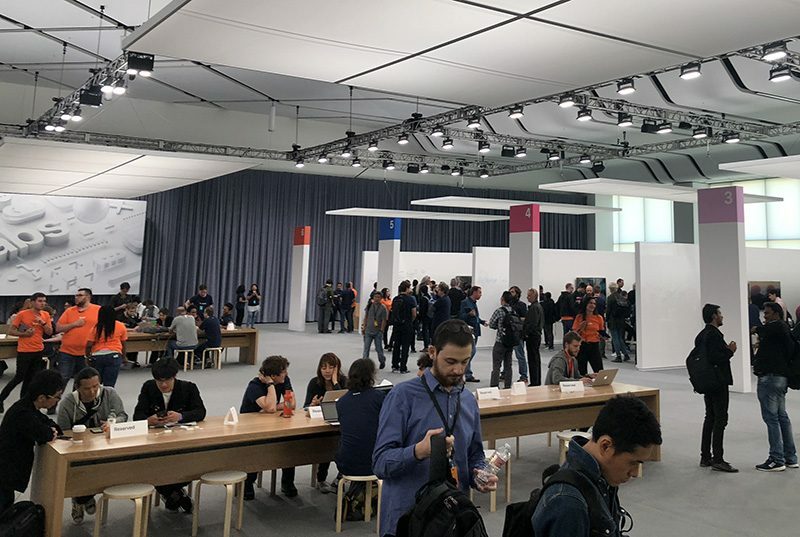 This event provided developers with a closer look at what’s new in iOS 12, macOS Mojave, watchOS 5, and tvOS 12, including tools and frameworks. Many scholars also sat in on the Apple Design Awards on Monday afternoon, recognizing excellence in app and game design over the past year. 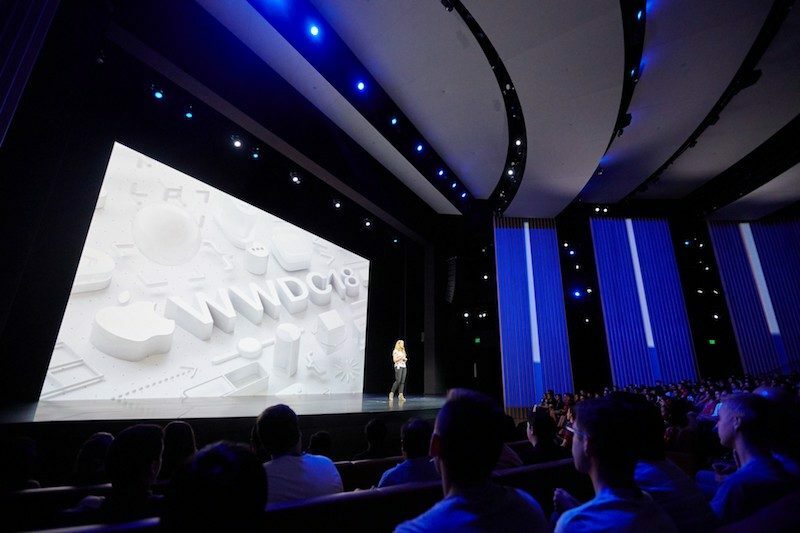 Tuesday marked the first day in which scholars participated in almost entirely the same activities as the general track of developers attending WWDC. 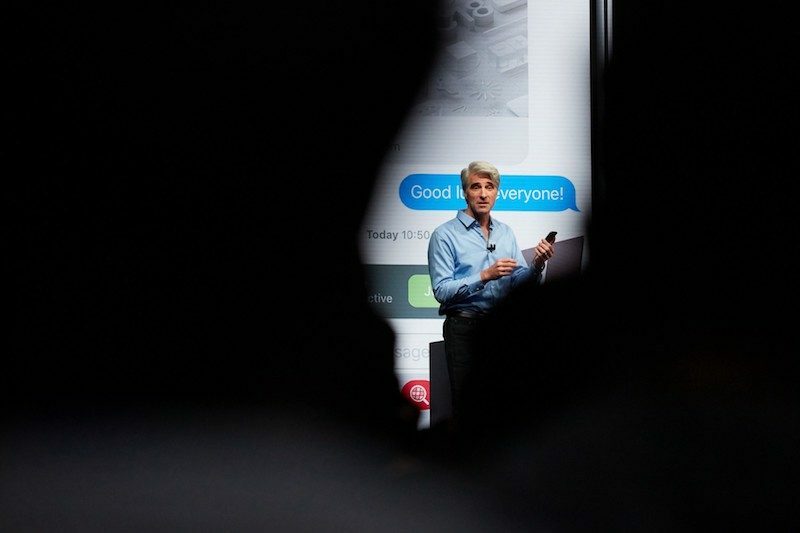 Apple began its sessions on this day, ranging from What’s New in watchOS to Introducing Dark Mode on macOS. Labs also began, enabling developers to book appointments with Apple engineers for one-on-one help on user interface design, accessibility, app review guidelines, marketing, analytics, distribution, and more. “At the labs, I got quite a bit of help on some issues we’ve been struggling within our Apple Watch tennis app Swing regarding custom table view cells and Watch-to-Watch communication,” said Swupnil Sahai, a 26-year-old, two-time WWDC scholar who recently completed his PhD in Statistics at Columbia University. In the evening, some scholars headed to the California Theatre, where Daring Fireball’s John Gruber sat down with Apple’s vice president of marketing Greg Joswiak and vice president of AR/VR engineering Mike Rockwell for a live recording of his podcast The Talk Show. MacRumors was also in attendance. 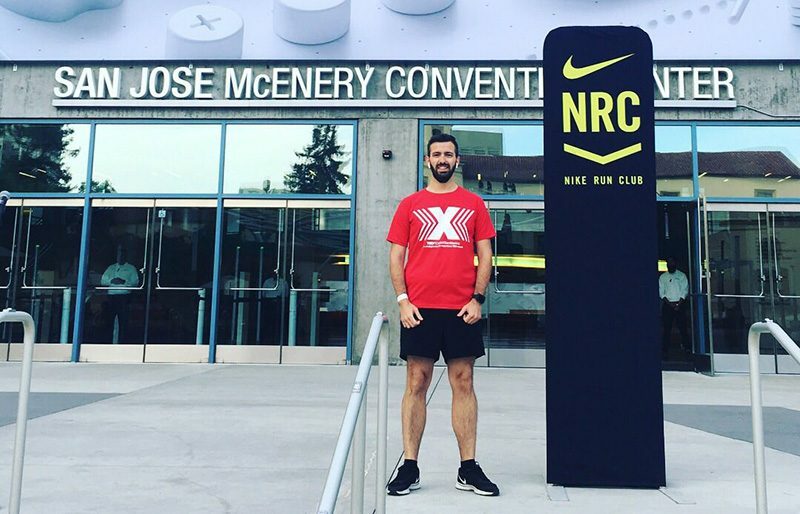 Labs and sessions continued on Wednesday after an early morning WWDC Run through San Jose with Nike Run Club, where some scholars met Jay Blahnik, Director of Fitness and Health Technologies at Apple. Wednesday also marked the beginning of Women@WWDC initiatives, starting with breakfast at the Hilton San Jose. 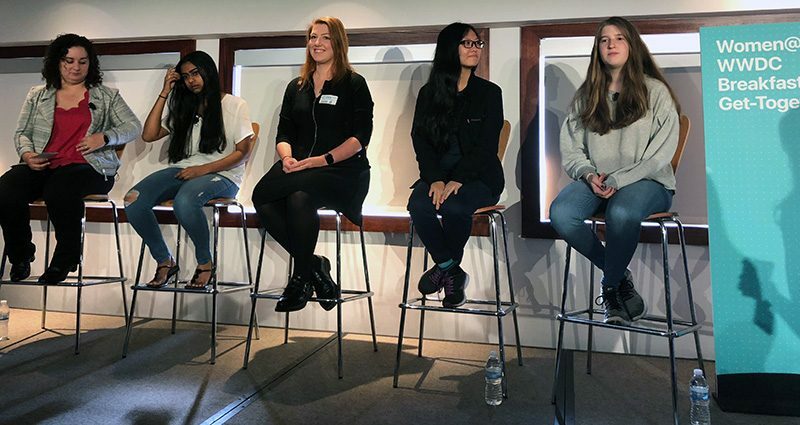 Later in the day, Apple hosted a panel discussion with female WWDC scholarship winners, moderated by Adele Peterson, co-chair of Women@WWDC and an engineering manager at Apple. One of the scholars who attended the panel discussion was 25-year-old Marina Rose Geldard, better known by her nickname Mars. 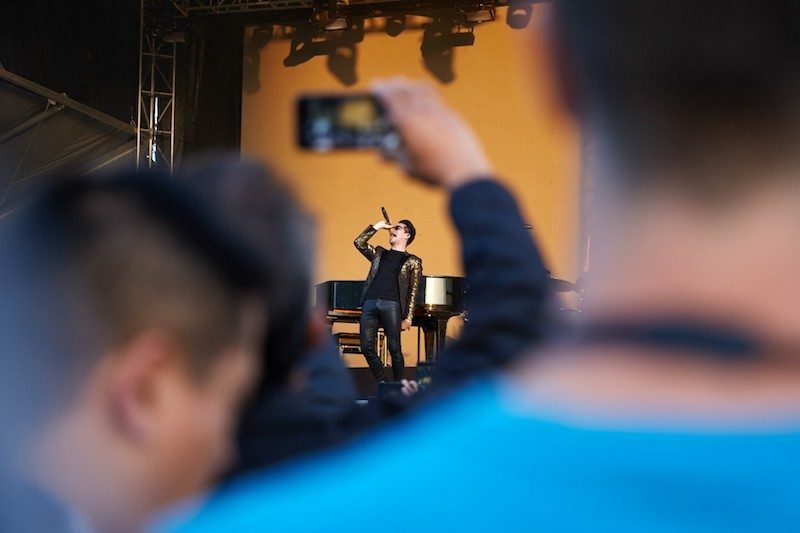 A third day of labs and sessions was followed by the WWDC Bash on Thursday evening, featuring a DJ and rock band Panic! at the Disco. Apple provided a variety of beer and wine at the Bash, although of course, many of the scholars were under the age of 21 required to drink alcohol in the United States. Nevertheless, most had an enjoyable time. The final day of WWDC involved a handful of final labs and sessions, but by this point, some scholars were heading to the airport to fly home. It was a bittersweet ending to an equally fun and exhausting week. 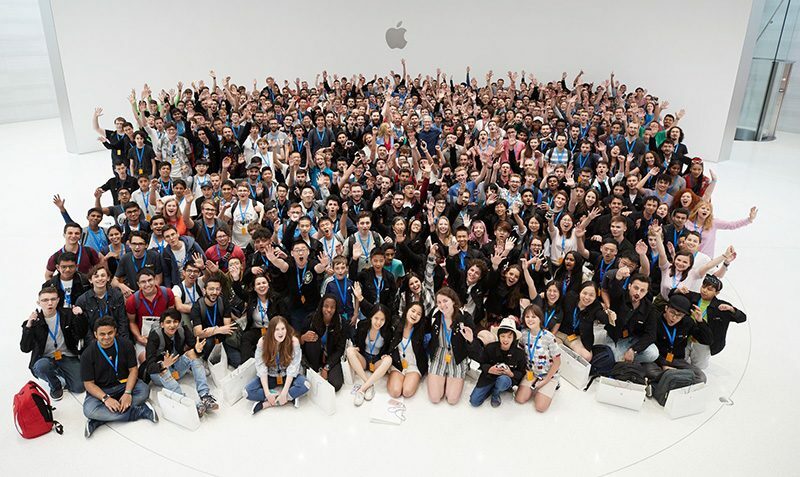 “All in all, WWDC was one of the best experiences I have ever had the opportunity of going to,” wrote Mohammed Ibrahim, a 16-year-old WWDC 2018 scholarship winner, in a post on Medium. The designer-developer at CoherentHub in Toronto, Canada also provided us with some advice for future scholars. From top left to bottom right: Amit, Omar, Ferdinand, Marina, Sai, Nicola, Swupnil, and Erik. Not pictured: Axel and Sophia. Ferdinand Loesch, a 20-year-old German student studying computer science at Oxford Brookes University. He is currently developing an accessibility tool for macOS to control the mouse with facial movements. Marina Geldard, a 25-year-old Australian student in her final undergraduate year at the University of Tasmania in Australia. She is interested in Data Science/Machine Learning and Information Security. Axel Boberg, a talented, aspiring photographer and WWDC 2018 scholarship winner from Sweden who provided many of the beautiful photos in this write-up. Omar Al-Ejel, a WWDC 2018 scholar and University of Michigan computer science student. He has published seven apps on the App Store and is an aspiring engineer. Sophia Kalanovska, a Bulgarian computer science student at King’s College London. She is also a committee member of KCL Tech Society, a teaching assistant at iOS workshops, and an intern at Salesforce for summer 2018. Erik Martin, a 17-year-old WWDC scholarship winner going into his senior year of high school in Orange County, California. After he graduates, he plans on pursuing a degree in Computer Science. Amit Kalra, a soon-to-be high school senior from Union City, California. He is the developer of the popular app 6284 Calc and Our SolAR. Sai Kambampati, a 16-year-old WWDC 2018 scholar, soon-to-be high school senior in in Carmichael, California, and contributor at programming tutorial website AppCoda. He has a popular news app for iOS named Views News Redesigned, and he has also recently developed a macOS app called MagicDown, a Markdown text editor. Swupnil Sahai, a 26-year-old, two-time WWDC scholar who recently completed his PhD in Statistics at Columbia University. He is currently a Senior Computer Vision Engineer on the Autopilot team at Tesla. On the side, he has developed an Apple Watch tennis app named Swing that incorporates CoreML. 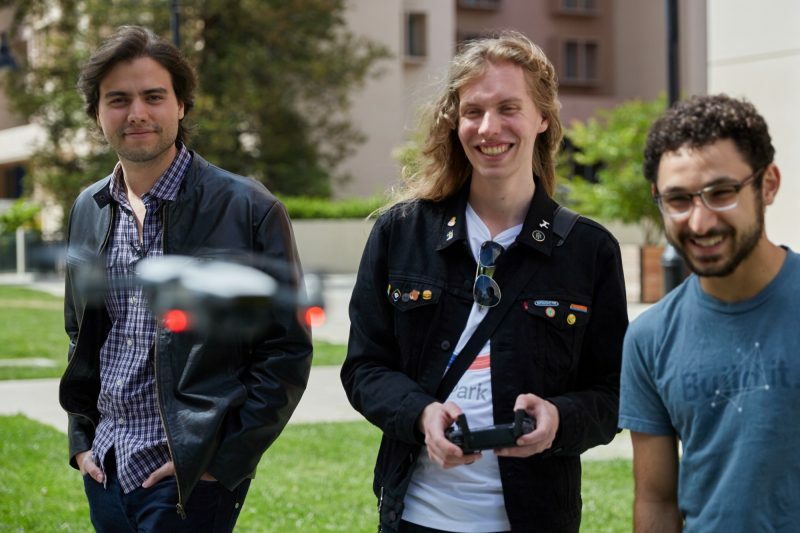 Nicola Giancecchi, a 25-year-old, four-time WWDC scholarship winner from San Marino. He is studying for a Master of Science in Computer Science and Engineering at the University of Bologna, while working as an iOS developer at Wire, a secure communication platform. Mohammed Ibrahim, a 16-year-old WWDC 2018 scholarship winner and designer-developer at CoherentHub in Toronto, Canada. I’m confident that these bright, young minds will help to shape the future of technology in the years to come. Many of them have already come up with innovative apps and ideas. Congratulations to this year’s winners.